Plus custom equipment cards and photoshop templates. Update: Now contains Season 3, Angry Neighbors, Dog Companions, and Limited Edition/Kickstarter cards. See my follow up post Zombicide #2 How to print the ultimate spawn card deck. Lately I’ve been playing a lot of the awesome hobby that is board games. The last few years have seen a renewed interest in board games likely aided by the internet and its ability to provide crowd funding for a range of new and exciting games. One of these is Zombicide which was funded in 2012 and raised a respectable $780k. 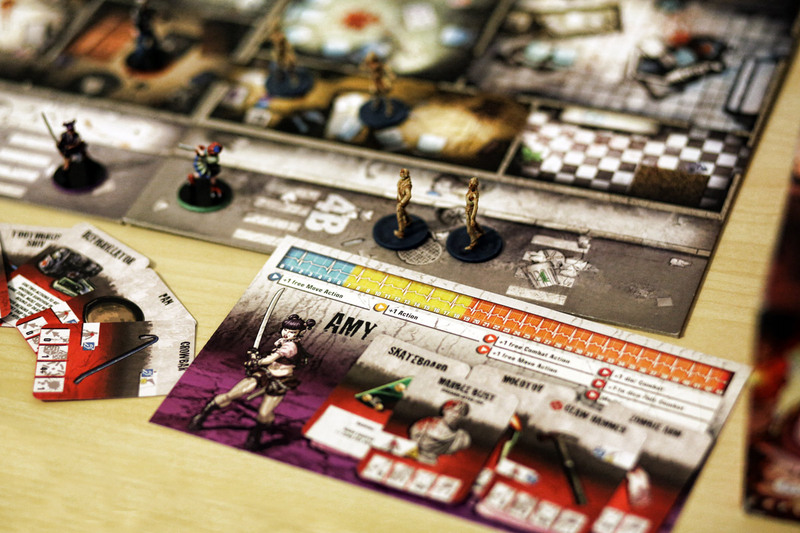 Zombicide is a thematic co-op game for 1 to 6 players. Each player controls between one (for 6 players) and four (solo game) survivors, humans trapped in a zombie-infested town. Basically lots of dice rolling, zombie minis, crazy weapons… what more could you ask for in a board game. How about more crazy weapons and equipment! With that thought began my quest for the ultimate Zombicide equipment deck. There are a number of custom card printers but none that I found can print the mini-card size that Zombicide uses so the only alternative is to re-print the entire base deck in a slightly different size. Which sounds like a bad idea if it wasn’t for the fact that you can easily and cheaply print cards through a number of online printers such as PrinterStudio and ArtsCow but more about that later. Guillotine Games has released high-res basic card templates and some of the cards in high-res on their website. However not all of the cards are available online in digital format. After a whole lot of searching online I managed to find that there is a Zombicide companion app. After extracting all of the equipment card image assets from the app. I now had all 52 unique equipment cards from Season 1, 2 & Toxic City Mall. Time to make some custom cards. Unfortunately I wasn’t able to find a equipment card photoshop template that contains all the features I needed so I build a new one which I have included in the download. Using this template I created a bunch of custom equipment cards. Here is a sample of some of the custom cards mixed in with the base cards. In order to re-print the equipment decks you will need to print the following. That works out to 173 equipment cards and 46 wound cards. However you won’t need 46 wound cards so I recommend you print around 16-24 wound cards. I printed my deck through PrinterStudio which for a 224 card deck came to $14.60 (Note: these prices have now changed, you may need to shop around or wait for a sale). This gave me 27 cards to use for custom cards after re-printing all the base cards. Here is the deck type I used http://www.printerstudio.com/personalized/custom-blank-playing-cards-mini-size.html. I’m currently in the process of creating translated survivor id cards. For this I need survivor pictures without the background. With the pictures found online it’s not easy to get good results when removing the background, because there is some blur on the images. You are talking about extracting the card images from the app. Could you provide some details about this? I’d like to do this to get the survivor images from the app. Sure I can help you with that I used this program to extract the assets (https://github.com/ata4/disunity) since it is a Unity3d app. 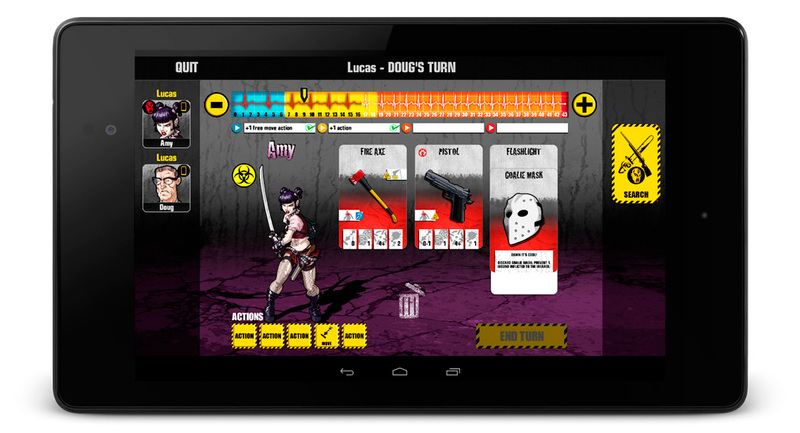 First you need to find the Zombicide OBB file on your Android Phones SDK. Extract that using 7-zip or similar and then find /assets/bin/Data and extract the files in there using disunity. Here is a zip file that I prepared earlier with all the extracted assets it contains all the characters in PNG with backgrounds removed (https://mega.nz/#!GdplTI7R!u0-vcTB8eQKKlhVY4Ytn7tHHnOd240HoPDKkK5JPTAc). Awesome, thanks for this. I wasn’t super interested in printing existing cards but now I know how to get real cards of the custom designs I’ve made. I would like to see you do the upcoming seasons and expansions, too. I need an AK47 to customize, haha! And if you know of a place that prints the right size, front and back, for character cards, I would like to see that, too. I’m just waiting for the app to update with the new images from season 3 before I can grab the new images. As for the character sheets I’m not sure but your best bet would just be to take them to a local print shop and print onto card stock and then just get it cut to size. The character sheets won’t be difficult since they don’t require the special card paper that playing cards do. Do you by any chance have any of the other cards such as the Companion Dogs or the Cards that come with the VIP Zombies? I was browsing the database, but the Rifle was missing. Also, any chances you’ll make S3 equipment cards? Thank you for documenting your process so well and sharing the files. Hey, just trying to put an online version of Zombicide together and saw your equipment cards, only problem is you didn’t put a rifle in the Season 1 deck. TY Patrick. Love these lists for the game. Hey man, found your website very useful. Having brought the base Zombicide game I want to make an equipment deck that includes equipment from all expansions (I intend to buy the tile and token sets from the small box sets but not the whole expansions) for some custom campaign rules I’m working on. Do you have access to high res equipment cards for Rue Morgue and Angry Neighbours, or would that rely on those expansions being released in the app? Do you plan to do it again when the zombicidee companion app will be updated in 2016 ? How do you insert the pictures into the template on photoshop? I used your guide to print more equipment and spawn cards – very nice. Only printerstudio.com had a mini card size of 2.5×1.75 inches, while my base game (Season 1) has mini cards of 2.5×1.6 inches. so not quite a perfect match if you want to mix cards. Not sure if you come here anymore. I was wondering if you could provide a tutorial on how to use the disunity tool? I downloaded the tool, got the latest OBB file for the app, but have no idea how to use disunity to “extract” the files. All the tutorials are from years ago and don’t make a lick of sense to me. i’m jut going round in circles. I was very confused in how to use Photoshop to create these cards. A brief explanation would be very helpful. I looked at Printer studio and it’s so much more expensive now, any other sites you would recommend? I definitely agree with James and also am curious if you know any sites that print out these custom cards. Not sure George it was 2 years ago that I printed them. Maybe check out Boardgamegeek for recommendations. I’m so sorry to bother you and I know it’s been a while and also a lot to ask but do you think it would be possible if you could add the Rue Morgue, and Angry Neighbors cards to your database. I wouldn’t want this to be a hassle in any way but it would just be so awesome and helpful of you. Thanks again. This is done now please see the updated links above. Very nice Patrick, thank you ! Do you have the fonts for Photoshop files? Note Cracked and Crackhouse are the same so just replace it with Cracked. ITCavantGardeStd and HelveticaNeueLTStd aren’t used any more so you can just replace them with Eutostile but they shouldn’t be used anywhere. That is because the actual fonts used on the official cards are inconsistent and vary but for custom cards just stick to Eurostile. apparently your templates are too big for printerstudio.com. As soon as i drag them in there, the outside gets in the ‘cut-off’-zone. Do you have any smaller templates for the equiplment cards? Not sure since I used printerstudio for mine and it worked fine. I did leave a lot of bleed area around the card for that reason. Make sure you are using the correct minicard size since they offer a few variations. Amazing work. Any chance you got extra cards for black plague too? I just wanted to say “thank you” for all your work, here – with the Zombicide cards. My wife and I are getting old and we (mainly just me!) find the print on the physical cards that come with the game too small to read. You’ve been a massive help – thank you. Patrick, just want to say great work! Do you have any tips on extracting the cards from the new Black Plague app? Love your Black Plague work… cool Stuff. do you have a template for selfprinting. thicker foto gloss paper will work. nearly the same papertype. not exact but good enough. I only miss a good template and Backsides for the cards (Black Plague) and or Blanko Cards (perfect to fullfill the paper an have some handcustomable cards. I posted a Black Plague PSD card template on BoardGameGeek here https://boardgamegeek.com/article/25992301#25992301 it includes the backsides. I want to ask you if can you upload the Kickstarter zombicide black plague exclusive cards? please. Sorry – I am a new Zombiecide addict trying to put together a printerstudio order of the PATRICKMEGADECK(s). Great work and such a public service. I am a it confused though about the quantity of cards to order, and how exactly you would use this deck. So what do you do with the repeated equipment items as you go down the master .doc list adding them to the card order? 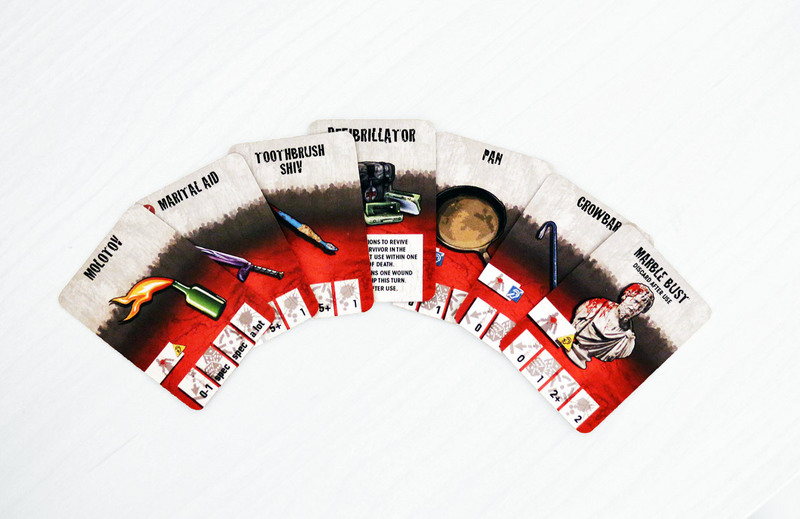 In the base game equipment deck, there are 4 ‘AHHH’ cards – and 4 more included in Prison Expansion, and 6 more in the Rue Morgue. Do you print out all of them (and the other ‘repeated’ equipment) and combine the whole glorious beefy slurry to form the MEGADECK? If I wanted to use this in the base game I would just use the mega deck as printed instead of the stock one, right? Also, it does seem like some of the stats and text on the bottom and top of some cards are into the bleed off, when dropped into the (stock) individual card slot templates on the printerstudio deck builder. Do they come out ok or need to be individually adjusted? Also, how do you get the wounded cards to be double sided with the same wounded image? Sorry for the questions and THANK YOU! So awesome. – I didn’t have any issues with bleed on the cards I printed. – I didn’t bother re-printing all the Ahhh! cards since I only play with 4 people. You can always skip printing them since they sit in a different deck. – For the wounded cards you should be able to add a different card back (I was possible when I printed them). All the custom cards are in the downloadable zip archive. Check out the link above. Question: Could you update the PSD for Black Plague to contain color variations for the ribbon in the magic illustration? It currently is green but there are illustrations with a blue ribbon, like with the ice blast jpg you created. You should be able to adjust the background layer color using the Hue/Saturation layer effect. Check out this tutorial (https://www.youtube.com/watch?v=YEY4RID2dlc). The original Zombicide files were built with additional bleed. Unfortunately I haven’t had time to rework the Black Plague files to include bleed. It should be fairly easy to use the clone stamp tool to add the sides in and then apply that to all the files with a Photoshop action. Thanks for the advice Patrick! No worries, you’ve done enough to give a fantastic head start! I’ve touched up the Black Plague PSD and threw it on my site. I increased the size for additional room for bleed, specific to the PSD template provided by PrintStudio. I also added is the ability to customize your own colors for enchantments, card backs, and magic. Hi! Thanks for all of the amazing stuff! This seems to be very nice way to create custom decks and combining them with the official decks. I have S1, S2 and BP, and more variety is definitely needed. Are there some copyright issues regarding re-print order from printerstudio or some other company? Has somebody used Game Crafter´s (https://www.thegamecrafter.com) services for this project? Recommended Printer Studio´s prices seem to be higher now. Excuse me, can you send me or post the survivvors cards? iit would be great to be able to print them as well. I try to print with Printerstudio your cards but they say to me that I must have an Authorization from owner license to print the logo Zombicide! Same for thing for me. They won’t allow the Zombicide logo on the back of the card. I have yet to find another print service that will do this. Having the same issue with printers not allowing the Logo of companies to be printed. Getting the same issue with local FedEx print shops as well for other custom game related things. If you have problem with Zombicide logo, use another printer site web : Make playing cards. It is the same thing as Printer Studio but no problem with copyright. Hey, great job! Could you add Zombicide: Green Horde cards too, now that they are available in the mobile app?